Early Man is encoded with Dolby Atmos and, if you have a surround sound system, you can definitely hear the difference. Let's face it, you can't stop progress…or can you? One age led into another and made way for innovation and change. But what if the older age fought back? 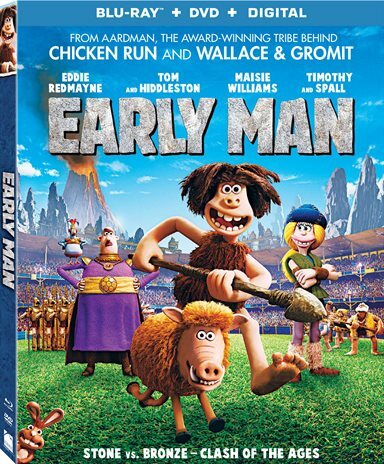 From the people who created Wallace and Gromit and Chicken Run they now give you Early Man. The stop-motion/claymation animated feature comes to Blu-ray and DVD this week and any parent with little kids, especially those that love soccer, will want to buy this to add to their collection. Doug (Eddie Redmayne; Fantastic Beasts and Where to Find Them) and his tribe live peacefully in the valley. They work together hunting rabbits and are essentially one big happy family. Doug has delusions of grandeur and tries to convince the Chief (Timothy Spall; Sweeney Todd: The Demon Barber of Fleet Street) to hunt a woolly Mammoth but he thinks they should just stick to the rabbits. Then, one day, they hear a huge beast, which they think is a Mammoth coming but it is really Lord Nooth (Tom Hiddleston;Thor: Ragnarok) in his massive Bronze machines looking for more Bronze to mine. Lord Nooth chases Doug and his tribe away to the badlands but Doug gets caught and finds himself inside the fortress where the Bronze age lives. While there, Doug sees a game of Football, which is sacred like religion to the Bronze age people, and decides to challenge Lord Nooth to a game. If the tribe wins, they keep the valley but if the Lord's team (who are basically professional) wins, the tribe goes to work in the mines digging for bronze. Along the way, Doug meets Gonna (Maisie Williams; Game of Thrones), a Bronze age girl who wants to play football (which is of course forbidden). She goes with Doug and trains the tribe in order to help them win. Redmayne, Williams, and Hiddleston all lend their vocal talents to this film and it pays off. Hiddleston, in particular, is unrecognizable as he gives Nooth a French accent. The script is entertaining with humorous moments and the movie will certainly appeal to its target audience... those ordering a happy meal at McDonald's. The real treat is the stop-motion/claymation animation. The attention to detail is apparent and nothing is left undone. Having taken over two years in preproduction, the end result is an amazing film that was worth all the work that went into it. The Blu-ray is presented in 1080p high definition video and the quality is excellent, which is especially nice because of all the aforementioned details that went into making the characters and the backgrounds. The audio is Dolby Atmos and, if you have a surround sound system, you can definitely hear the difference. The sound effects come at you from all angles while the dialogue comes through the center channel clearly and cleanly. The combo pack has the following features: Before the Beginning of Time: Crafting Early Man, Nick Park: Massaging the Funny, The Valley Meets the Bronze, and Hanging at Aardman Studios: A Workshop Exploration. None of them are terribly long but are interesting enough especially if you want to do stop motion/claymation animation at some point in your life. While Early Man has a few laughs and some scenes that made me crack a smile, the movie is decidedly British and you have to remember that their sense of humor is different from American's. Despite that, the moral is clear as can be and hopefully, the movie can teach some kids a valuable lesson. Download Early Man from the iTunes Store in Digial HD. For more information about Early Man visit the FlickDirect Movie Database.